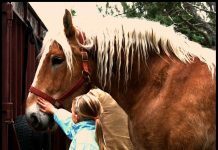 As of Jan. 3, Friends of Sound Horses (FOSH) will be reporting all current Horse Protection Act (HPA) suspensions on it website www.fosh.info/hpalist.htm. The federal HPA illegalizes the showing, selling, auctioning, exhibiting, or transporting of sored horses. Soring is the deliberate infliction of pain on a horse’s front legs, via chemical or mechanical means, to make it painful to bear weight. The United States Department of Agriculture (USDA) is the government agency responsible for enforcing the federal HPA. HPA violators are banned from showing their horses for a period of time. Publishing the suspensions list is in line with FOSH’s mission statement, which is to fight soring of gaited breeds. FOSH is one of many organizations that has targeted the Tennessee Walking Horse industry for its lack of self-policing against the soring of “big lick” show horses. Big lick is the term used to describe the high-stepping gait of some Tennessee Walking Horses. 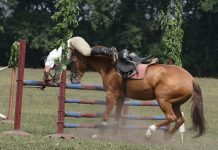 Critics claim the gait is manmade for the show-ring, and is achieved only through devices such as chains, padded shoes and soring. The suspensions listed on the FOSH website include those imposed by the USDA, as well as some current suspensions that have been reported to the USDA. FOSH will update its website as it receives new suspension lists. I am glad! Great article! great! I love this article! yes !!!!! PUT THOSE NAMES OUT THERE ! The list is a very good idea. I looked thru it to see if I saw any familiar names, and I noticed, there was a LOT of TN abusers. That is horrible! I am from TN and we love our horses here, and I hate to think it can happen right next door to you, or at the show you’re at. But I am very happy they are trying, step-by-step, to stop it all together!! Soring horses is done by lifes loosers, they feel they need to win any way they can. I am so thankful to any group of folks who will try to end this misery for all the beautiful horses involved. The list has to be made public. Those poor Twh’s!That is so true,and I sent money to help them,becuase that is down right wrong! How can a trainer be on the suspension list and stil showed at the walking horse celbration this past year. And if the trainers are suspended, why aren’t the owners of these horses also suspended.